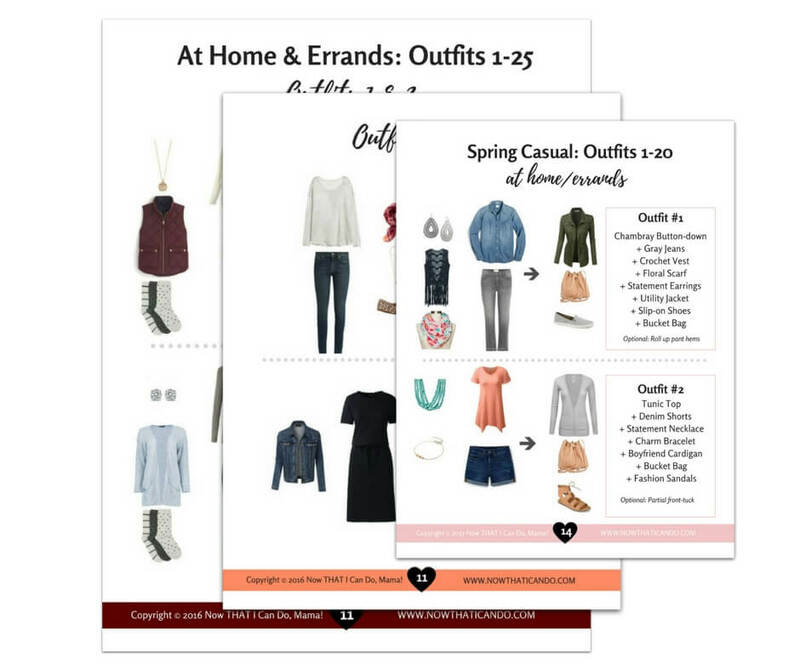 My ebooks Show you how to create an On-trend mom wardrobe, and visually show you tons of outfit combinations using that wardrobe... So You Don't Have to Think About it each morning. Here's How I explain it, some more! You CAN Get your mom wardrobe from Frumpy to fabulous on a budget. Ready to Transform your wardrobe? Fast track to a better wardrobe with a done-for-you wardrobe plan. The wardrobe checklist is pre-filled with your color palette. Simply print it out to keep track of what you still need and take it with you for reference when shopping. Easily prioritize what you want to buy so you can shop like a boss. Save money by extracting your capsule from your existing wardrobe. Learn everything you need to know about how to create a usable mom wardrobe starting with what you already own. Walk step-by-step through the process of "capsuling" just a part of your closet while keeping your larger wardrobe in tact for future seasons. Don't be left guessing how to put the pieces in your wardrobe together. Each eBook includes between 30-50 outfit layouts for you to copy using the wardrobe you've created. All the outfit guides (except fall) show you an at-home and a going-out version of each outfit. Dressy outfit ideas are included for more formal events. Find outfits easily by using the index of clothing pieces. You don't have to be alone as you recreate your wardrobe and try new styles. With the access to the outfit guides, you too can try the Outfit numbers being discussed, get tips on where to purchase capsule pieces, and get ideas for alternative pieces. Each of the eBooks also gives you access to a private online gallery of the outfits. Easily swipe through outfits to choose something to wear in the morning or before a special event. Sort by clothing pieces with a single tap to instantly locate outfits you want to wear. Keep a hard copy on your dresser for easy reference. Do you prefer your books in print? These eBooks are formatted with printing in mind. Simply take the PDF file you receive to print a booklet at your local office supply store. FAQ: Is an Outfit Guide Right for Me? A. 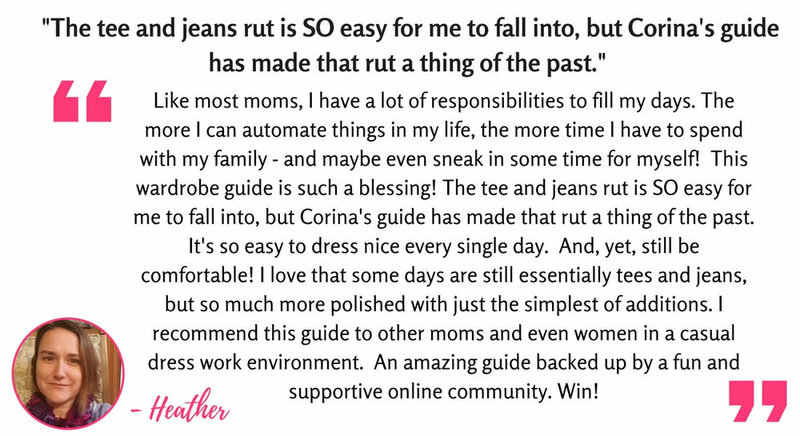 With hundreds of moms using the outfit guides each season you'll find examples of the outfits on real people within the Frumpy Fighters Facebook group. Just search "Outfit #" within the group and those posts will appear. A. Yes, you'll want to get the Full Year Wardrobe Guide at checkout. A. On average most people only actually wear a third of the outfit potential because they gravitate towards the looks they're used to and comfortable with. These guides are designed to take the decision of what you’ll wear out of your hands, both saving your time and energy while also helping you try combinations you never thought of before. Even though I’ve planned the different outfits in the guide myself, I still fall into ruts of wearing my pieces the same way when I don’t refer to my outfit guide! Click the button below to move on to the prices and comparisons page.